due to causing damage to the Partition Panel in the 24 hour test. No Envirofluid product caused surface damage to the Partition Panel with the Purasolve Graffiti Remover being the most effective in removing all types of Graffiti followed by the purasolve Spray Gel. 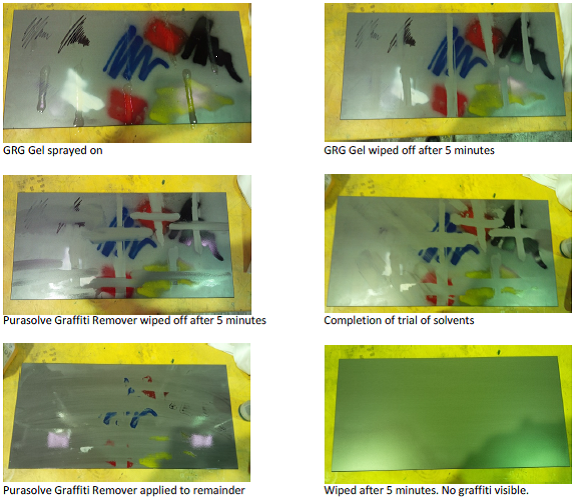 improves graffiti removal and reduces product usage, making it a very cost effective Graffiti Removal solvent. Solvents were applied to the Partition Panel and left 24 hours to assess potential damage to panel. No damage to Panel with Purasolve Spray Gel, Easysolve, Purasolve Graffiti Remover. Slight dulling with conventional graffiti remover. completely removed from the panel to trial the next solvent. be the most effective for the Partition Panel. The Purasolve Graffiti Remover was slightly better overall being more effective on texta than the Purasolve Spray Gel.